↑ Giudice, Christian (2009). 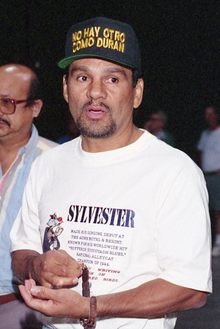 Hands of Stone: The Life and Legend of Roberto Duran, pp. 14–15. Milo Books Ltd, Lancashire, United Kingdom. আইএসবিএন ৯৭৮-১-৯০৩৮৫৪-৭৫-৪. ↑ Giudice, Christian (2009). Hands of Stone: The Life and Legend of Roberto Duran. p. 27. Milo Books Ltd, Lancashire, United Kingdom. আইএসবিএন ৯৭৮-১-৯০৩৮৫৪-৭৫-৪.